Chris is the CEO and co founder of Pushpay. Pushpay provides a mobile giving and engagement system to the faith sector, nonprofit organizations, and education providers in the US, Canada, Australia, and New Zealand..
Kenny Jahng: Welcome friends it’s Kenny Jahng here once again with the Future.Bible podcast. Thank you so much for listening to what we are doing, which is taking a journey across the interwebs, meeting with really interesting, innovative, thought leaders, entrepreneurs and church leaders across the country. One of the things that we’re doing today is we’re making a stop on the west coast partly because that’s the home of Dj Chuang who’s not with us today. My co host is actually out traveling today. He’ll be back next week, but we’ve got an excellent conversation partner here. Chris Heaslip from Pushpay is with us. Welcome to the show, Chris. Chris Heaslip: Great. Thank you so much for having me. Kenny Jahng: So Chris, you are the CEO and co founder of Pushpay and prior to that, and I think you’ve done tons of entrepreneurial and financial stints in the backgrounds, CEO of accounting brands, other accounting, big six accounting firms. You also hold a master’s degree in taxation accounting from Auckland. And so finance, entrepreneurship, and the church is something that you’re interested in. You split your time between Seattle, Washington, which is the home base in the US and what’s interesting enough is that Pushpay also has operations across the pond or in New Zealand. So why don’t you start there and tell us a little bit about the New Zealand’s connection to Pushpay? Chris Heaslip: Yeah. Well, I’m from New Zealand originally. I still have my New Zealand accent, unfortunately. You know, we really just had a vision for “what if we can make giving as simple as buying a song on iTunes?” And so, we put our money into trying to figure out how to make that happen and uh, ended up hiring some engineers in New Zealand. And over time we now have about a hundred engineers in New Zealand working on building the product and everyone else in the company is mostly up here in Seattle. Kenny Jahng: That’s nice. I’ve been looking forward to this interview in particular because you’re working with literally thousands of churches and ministries nationwide here in North America and internationally. But in the North American landscape for Christianity in particular, it’s been very interesting. So I’m wondering if you could just give us a snapshot of where churches are. How are they embracing technology? Like are they, are they all stuck in like the AOL, MySpace days or are they coming along like what’s your perception because you are across states, across regions, across denominations. You get to see a big macro pictures. I’d love to hear from your point of view, where the church is in technology today? Chris Heaslip: I think it’s a really great question and my experiences that churches are really hungry to learn and to adopt technology. But as you can see it as a slightly different problem, which is the vendors who largely serve churches, not excellent. And if they were competing in other spaces, you know, we would say, wow, like this technology is more like my space. And so, you know, I think, how do the challenges, we’re a business and we have a heart for the church and we feel like we’re in ministry because ministry is why we do what we do. But we just happen to use the mechanism of business to be able to fund and build what we hope is a world class product. And you know, I think about, how God has used business historically and one of the examples that comes to mind is around Gutenberg and meeting the printing press. You know, he was a businessman and he had a fulltime job and ended up quitting his job to go and try and beat this printing press the raise money from investors and you know, had a lot of trouble with those investors and ultimately managed to crack the code on building a printing press. Chris Heaslip: That really revolutionized how we get the Bible into the hands of everyday people. And then it had a ton of additional benefits for society to call it the light him an agent, all of that kind of good stuff. But you know, this was a businessman. It wasn’t a pasta trying to, and being the printing press was a business men trying to do it from a business perspective. And I think, you know, that’s the role that business should play in partnering with the Church to build, in revolutionary technology that helps to get the Bible into the hands of people and helps churches to connect with people. And I think there’s just still such a huge opportunity there that is really limitless because, you know, people are desperate and hungry and need the Good News that we have. But you know, we struggled to get the message to them. Chris Heaslip: And so I think that’s where we see the opportunity in distinction of using business kind of techniques and meet the fun, but you know, trying to innovate and use God’s guidance to help, you know, bring cutting edge technology to the church. Kenny Jahng: It’s ironic, right? We look at paper today and we’re like, that’s not technology. And yet back in the day the printing press was a technological revolution. Chris Heaslip: Yes. It was a ride. I mean, they were printing presses about the movable type printing press that you could spin up and, you know, print different things was really a revolutionary at the time. And it took good and big over 20 years of his life to actually crack through on that. There wasn’t some silver bullet that happened to do it. That perseverance, you know, almost financial ruin for him to really be on the cutting edge was a huge cost. Chris Heaslip: But look at the impact that it made and then, you know, almost 80 years later, the Protestant reformation happening as a direct result of getting Bible into the hands of people. So, you know, I think, we like to think about the fact that, you know, technology changes can really proceed a reformation in the church. And, I think, you know, I certainly mobile technology today has the ability to reach a whole group of people who are going to step through the doors of your church. Kenny Jahng: Now, we talked about mobile technology today as that next revolution in our current times. And you’ve had a lot of successes. I think partner nutritious training them, helping them, enabling them to raise more funds, to support the mission through digital giving. In fact, I believe once that I saw is that if a church even have another giving solution before they changed to Pushpay, you’re still seeing something like a four x growth and giving. Chris Heaslip: So it’s not just about, access to technology. There’s something else about that, right? It’s not just give everyone a mobile phone, give everyone an app or giving everyone a texting number. There’s something more than just the pure material of the technology. What do you attribute that to? Is your technology more advanced than we just don’t see it? Or is it, what else is that it’s gotta be something else in your learning? Again, I think from the experience of working with thousands of churches, there must be something else that allows you to have better returns than other solutions out there. Chris Heaslip: Well, I think in the church, we like to think we’re competing with other churches or you know, to try and get people’s attention or things like that. But really, you know, when you consider the bath, the technology, the barriers now so high because we used to using Facebook and Instagram and Uber and you know, we come to church and sometimes we feel like we get Windows 95 type experiences. Chris Heaslip: And so the barrier is not just a little bit higher the barriers paradigms above our experience because this is what we used to. And the challenge is these folks at Facebook and Instagram and Uber have tens of thousands of engineers who are working on building this technology. And it has to say a lot of the time we have, you know, a few engineers working on building technology. And so, you know, we, we’ve really invested tens of millions of dollars to try and build technology at Pushpay to help facilitate that. And one of the things we’ve seen is that digital givers give 50% more than people are using cash and checks. Chris Heaslip: And, we sat digging in, I could couldn’t believe it. Why is this this like they can just be more generous. It can’t just be that, you know, digital. Give us a more affluent. So we started looking into the stats and we found something really fascinating that a digital givers don’t give more per donation. They give more frequently or consistently. Then people are using cash and checks. Kenny Jahng: And so more frequency, more consistency. Then the person who gives just once in a while, right, because you’re not always able to pull out your checkbook where you don’t always have cash on Sundays. Chris Heaslip: But also with church attendance or the frequency of which people would teen church declining. You know, my kids are sick. I can’t make it. We’ll, if I had my check giver and I’ve never been informed that we prefer digital giving, then what happens is my check stays at home with me on Sunday. Unfortunately, people don’t come the following Sunday. Kenny Jahng: Why is that Chris? Why don’t they bring that extra check? Chris Heaslip: I wish that was the case. So what happens that if I’m one, if I’m on mobile, I can just get out my phone and give him participate. Even if I’m tuned into what is the service online cause my kids are sick. But of course what’s even more powerful than they had as automated recurring giving. It doesn’t matter whether I’m there in person or not, my gift as happening. And then to your point, even over and above giving, of course, if I don’t have a checkbook, I simply can’t participate in additional offerings. So what we see is that those people who do digital give and say 50% more just because they’re able to participate when they’re not there on a Sunday morning. And also that they’re able to participate in special offerings that arise, which they didn’t perhaps come prepared for. Kenny Jahng: So, that’s a very interesting thing. And I think, um, 60% of church goers that are using Pushpay giving to the church is not on Sunday. Right. The majority of people are not confining or giving activities to that one hour on Sunday morning. And, that’s interesting to me. But, it’s interesting to me because the people, the majority of people are thinking about church and their relationship to the community and their responsibility in the community outside of Sunday. Do you think most people have capacity to or wants to engage with things other than finance with respect to the church Monday through Saturday? Are we limiting ourselves now in today’s culture? Has the dynamics changed where thinking of church only on Sunday for an hour is too limiting and that church leaders needs to start to think about not just giving outside of something but giving access to other things ministry wise, Monday through Saturday? What do you think about that? Chris Heaslip: Well, I think there’s 100% true. And just, just to give you one finance example of when people do give, you know, we looked at our data and found that, you know, Friday mornings is almost as much giving as happens on a Sunday morning. Chris Heaslip: And we say, what happens on a Friday morning? Well, Thursday night of course is, when people get their paychecks. And so, people, when they hear, hey, we should give our first and best, what they think of as will my first fruits the first thing I want to do when I wake up on a Friday morning is give my tithe or give my offering. And to me that’s unbelievable that that many people wake up on Friday morning and the first thing they do is they want to be able to give. And I think it goes to the point that you’re making that church on a Sunday morning, people want to engage and interact with you and with other folks in their church community during the week. And I think one of the things that we have to really consider is how do we make it easy for them to do that. Chris Heaslip: Because, you know, when it comes to technology, you know, technology has the ability to lower barriers so that people can connect. And there’s multiple different ways that we can do that. You know, one is through making sure that we have our, uh, our services and our content available on the online so that, you know, I’m driving, I can just pick up my app, open it and start listening to the service, or you know, to be able to connect in different ways. This have been as upcoming register the likelihood I’m going to have the time to sit down on a Friday, on a Sunday morning and fill in, some type of event form to attend summer camp or something like that is really limited. But if we can get that too outside of Sunday morning, you know, whether it’s content, some appeal or some action we want you to take, I think people are very, very willing to engage with that. Chris Heaslip: The keypad is, it has to be personal. And one example is, you know, here in Seattle we’ve just had terrible, it’s been doubling down with snow and the last, which is crazy in February that we have this much snow. And of course in Seattle, we’re not used to having that much snow at this time of the year. So a lot of churches have canceled different services. But you know, the church I’m a part of has five campuses across kind of the greater Seattle area. And you know, if you just send out a note saying, “hey, services cancel”, well what have one campus is cancel but one isn’t, how do we know which person we’re trying to message? And that’s where the personalization has to come in that, you know, through Pushpay, people can know, “hey, this person’s part of this campus because they give to that campus”, therefore we should message them through the Pushpay. The campus is open or they campus is closed. And that type of personalization is what we expect from other experiences. Just to kind of broad blast, “hey church is canceled” that can lead to us cancelling services. We don’t need to cancel. Kenny Jahng: That is a good point that we expected from other things in our culture and society. But, church actually has that capability now with technology and solutions like you guys offering. That’s very interesting. So, giving and generosity. So it seen by many students or consultants or experts as something that can’t be triggered if you approach it just with like a guilt and obligation messaging. Framing finances as part of like your spiritual discipline is one of the ways that many experts are saying is the best way to cultivate this culture of generosity. That is kind of like the holy grail for everybody in the church communities days. Connecting, giving with Biblical fundamentals. Right. Is Pushpay part of that conversation when you’re coaching, you know, with the pastors and the XP and the finance team, what does that type of collection that you’re seeing between the Bible and finances that the congregation needs in order to like unlock that spirit of giving and generosity? Chris Heaslip: Yes, absolutely. You know, I think, I was listening to Carry Me podcast the other day and he had Jud Wilhite on from Las Vegas and he said something really interesting, which I had thought about but really kind of summarized it, which is, you know, they have a kind of philosophy of how to get people into the church, which is, you know, behave, believe, and then belong. And I think a lot of times in the church we want to try and change people’s beliefs and try and educate them on why they should do giving and why, you know, this is what it says and all of that. But actually I think there’s ways to engage people to take a step of behavior that ultimately can lead to a belief change. And, you know, “hey, there’s an opportunity to participate”. One church I know, and Michigan, they have an appeal once a year when school goes back where people can buy a backpack for a child who’s going back to school. Chris Heaslip: And 100% of the proceeds go to, you know, a direct cause. Because we know, especially in millennials want to support causes and they want to know that the money is getting to a specific place. And so instead of trying to sit down and educate you on the 10 reasons, you should tie it to say, “hey look, why don’t you just simply give $20 to this particular cause?” And then they, you know, message back and say, “look, we’ll look what happened. Here’s a picture of a child with a backpack.” Look at the great picture. Kenny Jahng: Thinking transformation. Yes. Chris Heaslip: And they help take a step towards that because when your behavior starts to move, your beliefs start to change too. And I thought, “wow, this isn’t that a great way to summarize it.” And I think that if we can help people take a step forward in their behavior by lowering the bar and by making it easy through technology, then we can start to change beliefs along the way versus trying to start with the beliefs where people can just be very set in their ways and stubborn. It can be just picking a fight needlessly. Whereas who can argue with giving $20 to a bank. Kenny Jahng: Yes. That’s interesting. Now, one of the things I learned recently, it was that you guys or something like the number six largest app developer in the world. Is that true? Kenny Jahng: Which means you have experience with the mobile environment and people’s behaviors with mobile apps, etc. One of the things on the .Bible team at American Bible Society we’re suggesting right now is that every church needs to read the Bible together as a community. Sometime wherever you are in your lifecycle as a community within the next two or three years, you really should entertain the idea of a church reading program together, right? One study has shown that daily Bible reading is the best predictor of spiritual growth, right? And growing churches are giving churches. And with the shifts, right? People are not carrying their paper Bibles to church anymore. Everyone is conveniently, whether it’s, you know, a cop out or not saying their bibles in their pocket now. First, do you think that is having any impact on Bible reading programs and even their spiritual habits of people? Is that really something that, are we missing something from using paper bibles in our Bible reading efforts today? Chris Heaslip: I think the only has, something to that, I mean, as long as he had to carry a five pound Bible, the church with the other kids in tow and yes, you bet, you do have your phone with you and as accessible, but I personally struggle with sometimes to read on the small screen on the iPhone is extensible. Chris Heaslip: So you waiting in the doctor’s office you can read, you know, and certainly there’s some benefit to that. But when you really want to sit down and study and read the Bible, do it on such a small screen, I think because it’s really cold. And so I think it comes down to what are we trying to achieve and when is it because reading it on the go, it’s certainly very great for that. But trying to read and in some other setting it’s more difficult. And I think, about technology in general, one of the things that churches can do is how do we, you know, again, in this, you know, top of the millennial generation, how do we make it personal for you? You know, and I think one way we can do that is we can say, “Hey Kenny, I was just thinking about you today and this Bible verse this came to mind. Why don’t you check it out?” Right? And it’s like, “wow, someone has taken the time to also message”, you know, and then what’s going to happen? I’m going to go away and check it out. And so, there’s ideas and things that we can do to try and engage people in there, at least to try and get them started, right? At some point they’ve got to take responsibility for themselves. But I think that type of thing plays so well in this generation that we live in. People want to feel appreciated. People want to feel like, you know, “hey, I’m praying about you. Hey, this verse just came to my mind”, you know? And then of course, what happens? You don’t just go read the verse, you read the whole chapter and then you read another chapter. And I think that if we can just do some really small things like that, we can certainly get people more involved in that. Chris Heaslip: And that’s that kind of behavior. Then belief approach is, “hey, just read this. This might be applicable to you.” Then let’s try and change your belief on how to get to a daily habit to read the Bible. Kenny Jahng: Yes. I have this talk that I’ve since Netflix nation of the four cultural shifts that are happening. And one of the things I think that a lot of organizations, churches and non churches are guilty of this just because we have the technology to put everyone on a database and mass communicates to them at once. We end up treating people like they’re a barcode or a number versus personalization with a name. And that’s totally wrong. We got to use, we have to use technology to scale personalized relationships, not the other way around. Right? Chris Heaslip: 100% I couldn’t agree with you more. And here’s the thing, right? No church in America has a technology problem. No one has a technology problem. When we look at it, no pastor is laying awake at night saying, “wow, I just wish I could get some technology to do it”, right? It’s a people problem. We have a challenge trying to engage with people and what happens if we start with a technology solution and then try and make it work for people? It’s not going to work. It’s going to be, you know, not personalized. It’s going to not solve the problem. If we start with the people problem and then we say, how do we help use technology to change that, then we can really start to change people’s hearts and lives. And so the kind of vision I have for where apps are going to go in the future is that not going to change people’s lives. That’s not how it works. But they’re going to play an augmenting role in helping do that. And so if we can think about, you know, let’s say a single mother, a teen’s church on a Sunday, she has a great time. Let’s say she downloads the app, fills a visitors card, or makes a gift through the app, right? And then let’s say, you know, we go two weeks later, we’ve seen a push notification saying, “hey, we’ve got a summer picnic coming up in the park. Would you like to come?” And now maybe she doesn’t know Jesus. And you know, she doesn’t know a lot about church, but she says, “look, I’ve got two kids and having to run around in the park for a couple of hours, they would really just give me some peace and quiet, I’m going to go along.” And so she goes along and she meet some great people in. She gets plugged into a small group, right? And then, you know, she gives her life to Christ and then she gets a push into, “hey, this weekend we’ve got baptisms coming up and would you like to get back?” So technology changing, hospitalized, like definitely not, but you know, we can use technology to inform people and let them know, “hey, there’s a step that you can take to become part of this community.” And that’s where I think technology has to play that augmenting and assisting role. It shouldn’t take over the program, but if you don’t have programs that are designed to bring people in and help new people become part of your church, community, technology can’t do anything for you. So that’s the kind of vision we have for with it should go in the future as to how to connect with people in a timely, personalized and relevant way. Kenny Jahng: That’s powerful. I’ve just love everything you’re saying there and more people need to hear that too, right? Like, well let’s change gears a little bit. This year you’re hosting the summit. You’re Pushpay conference. I’m not in Anaheim, but in Dallas this year, this coming up, it’s in May 22nd and 23rd. Right? I’m excited. I’m going to be there. I will get to meet each other in person. That’s going to be great. The format and the size of the whole event is going to be quite different than recent years in the past. Right? Like you were actually augmenting the audience. I think from a couple of hundred to over 1500, maybe even 2000 people this year that we’re gonna expect. Right. What are you most excited about this year, moving into Dallas and having that bigger audience? What are we expecting as we go go to Dallas this year? Chris Heaslip: Yes, I think, you know, the cooling we feel we have and what we started with at the top of the podcast is that, there’s some fetters of business that churches can learn from. Churches are not businesses that would be really clear about that. But as I spent time with the top 10 and the top 20 biggest churches in America, you know, they have some things that they do to really look at numbers. They look at attendance patterns. They look at how many people turn. I look at giving. They predict these things. And so what we had for the conference is a vision that we want to get the executive pastors and we want to ask them some really difficult questions. And you know, previous summits with asked people, how do you hire people? How do you fire people? How do you, you know, put together a budget? Chris Heaslip: How did you come up with a strategic plan? How do you, do some of these things that can really assist other churches that are wanting to grow and become like the north points in the Christ church and the values and the cross fellowships or the world, you know. But we don’t often get to hear from those people who are not the senior pastors by the people who are the executive pastors actually making the day to day decisions on setting culture and values and how to engage with staff. And so we want to ask them really hard questions. This is not a inspirational conference. We don’t want you to go away feeling inspired. There’s a hundred other conference and we want you to go away feeling equipped that you heard some content that you haven’t heard before. And of course we have Patrick Lencioni and Cheryl Bachelder and you know, some incredible leadership mind. So coming to talk about leadership, but the breakouts and the panel discussions, for me personally, other reason that I love summit and it was the reason we put it on is to hear from the people actually running the churches making those types of decisions. So this is what we hope people will come away with it and practical things around technology, communications, leadership and getting the kind of really hard question sometimes people are afraid to ask from those people on the front lines at the, some of the biggest churches in America. Kenny Jahng: It’s one of my favorite events of the year. And I think this year the fact that it’s bigger, and some of the speakers you’re bringing the Speaker Roster is, I don’t know how your team does it every year, but you guys are killing it. Great value. And again, we’re going to be there, the American Bible Society team without bibles there. And I would want everyone here listening to reach out to either me or DJ so that we can meet up in Dallas at the events. Now, Chris, after listening into today’s interview, if someone wants to reach out to you directly, what’s the best way that they can get in touch with you? Chris Heaslip: Yes, I’m a big fan of Twitter. I love Twitter because among all other social medias, they’re great, but you know, obviously I’m @chrisheaslip, H E A S L I P or @pushpay. We would love to hear from you and you know, we have a ton of call need two available from our previous summers. You can access it all available free if you want to know what some, it’s like it’s completely free on our website. Kenny Jahng: Oh really? So some of the talks from previous years are available. Chris Heaslip: All of them are freely available online. You know, it’s just part of how we feel we can serve churches across the country, whether you’re Pushpay customer or not, you can access all of those previous sessions, you know. And there’s some amazing stuff from Seth Godin and you know, one of the things I love Scott Harrison and how he engages donors, and the transfers deeper, like incredible. So there’s all of that is freely available. Kenny Jahng: Wow. Well give us the URL once again so everybody can write it down or go to it right now. Chris Heaslip: This year it’s pushpay.com/summit and if you click through to the content section, you can find all of the previous summits as well. Kenny Jahng: And your website has tons and tons of other resources. If you’re a church leader, you need to, I would say almost book an hour on your calendar so that you’re uninterrupted and then just literally start looking at some of the resources that they’ve put together and published as amazing. So thank you so much Chris, for dropping by sharing your wisdom and experience with tech and giving them the Bible. Really hope we have a chance to revisit with you again soon. Chris Heaslip: Thanks Kenny, appreciate your time. 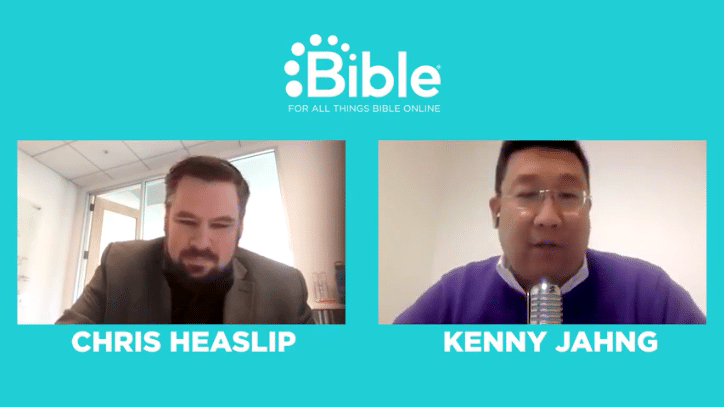 Kenny Jahng: Again, thank you for the conversation and thank you to our audience for listening to the Future.Bible podcasts. Let us know your thoughts and reflections about today’s interview. We are listening to you. It’s because of you, we reached out to Chris and it’s because of you that we’re getting these topics on board. So please, we look for your direction, for suggestions for future shows. We continue to ask for yet, but because we want to be the number one show where you’ll meet innovators, ready to talk about how we can apply that never ever evolving at world of technology to the unchanging message found in the Bible all for real life change. So my name is Kenny Jahng. Next time we’ll have DJ back in the chair would be in copilots a seat, but in the meantime, be blessed and be a blessing. 03:58 That really revolutionized how we get the Bible into the hands of everyday people. And then it had a ton of additional benefits for society to call it the light him an agent, all of that kind of good stuff. But you know, this was a businessman. It wasn’t a pasta trying to, and being the printing press was a businessmen trying to do it from a business perspective. And I think, you know, that’s the role that business should play in partnering with the Church to build, in revolutionary technology that helps to get the Bible into the hands of people and helps churches to connect with people. And I think there’s just still such a huge opportunity there that is really limitless because, you know, people are desperate and hungry and need the Good News that we have. But you know, we struggled to get the message to them. 09:24 if I’m one, if I’m on mobile, I can just get out my phone and give him participate. Even if I’m tuned into what is the service online cause my kids are sick. But of course what’s even more powerful than they had as automated recurring giving. It doesn’t matter whether I’m there in person or not, my gift as happening. And then to your point, even over and above giving, of course, if I don’t have a checkbook, I simply can’t participate in additional offerings. So what we see is that those people who do digital give and say 50% more just because they’re able to participate when they’re not there on a Sunday morning. And also that they’re able to participate in special offerings that arise, which they didn’t perhaps come prepared for. 11:26 what happens on a Friday morning? Well, Thursday night of course is, when people get their paychecks. And so, people, when they hear, hey, we should give our first and best, what they think of as will my first fruits the first thing I want to do when I wake up on a Friday morning is give my tithe or give my offering. And to me that’s unbelievable that that many people wake up on Friday morning and the first thing they do is they want to be able to give. And I think it goes to the point that you’re making that church on a Sunday morning, people want to engage and interact with you and with other folks in their church community during the week. And I think one of the things that we have to really consider is how do we make it easy for them to do that. 15:25 I was listening to Carry Me podcast the other day and he had Jud Wilhite on from Las Vegas and he said something really interesting, which I had thought about but really kind of summarized it, which is, you know, they have a kind of philosophy of how to get people into the church, which is, you know, behave, believe, and then belong. And I think a lot of times in the church we want to try and change people’s beliefs and try and educate them on why they should do giving and why, you know, this is what it says and all of that. But actually I think there’s ways to engage people to take a step of behavior that ultimately can lead to a belief change. And, you know, “hey, there’s an opportunity to participate”. One church I know, and Michigan, they have an appeal once a year when school goes back where people can buy a backpack for a child who’s going back to school. 18:34 I think the only has, something to that, I mean, as long as he had to carry a five pound Bible, the church with the other kids in tow and yes, you bet, you do have your phone with you and as accessible, but I personally struggle with sometimes to read on the small screen on the iPhone is extensible. So you waiting in the doctor’s office you can read, you know, and certainly there’s some benefit to that. But when you really want to sit down and study and read the Bible, do it on such a small screen, I think because it’s really cold. And so I think it comes down to what are we trying to achieve and when is it because reading it on the go, it’s certainly very great for that. But trying to read and in some other setting it’s more difficult. 19:17 about technology in general, one of the things that churches can do is how do we, you know, again, in this, you know, top of the millennial generation, how do we make it personal for you? You know, and I think one way we can do that is we can say, “Hey Kenny, I was just thinking about you today and this Bible verse this came to mind. Why don’t you check it out?” Right? And it’s like, “wow, someone has taken the time to also message”, you know, and then what’s going to happen? I’m going to go away and check it out. And so, there’s ideas and things that we can do to try and engage people in there, at least to try and get them started, right? At some point they’ve got to take responsibility for themselves. But I think that type of thing plays so well in this generation that we live in. People want to feel appreciated. People want to feel like, you know, “hey, I’m praying about you. Hey, this verse just came to my mind”, you know? And then of course, what happens? You don’t just go read the verse, you read the whole chapter and then you read another chapter. And I think that if we can just do some really small things like that, we can certainly get people more involved in that. 21:04 No one has a technology problem. When we look at it, no pastor is laying awake at night saying, “wow, I just wish I could get some technology to do it”, right? It’s a people problem. We have a challenge trying to engage with people and what happens if we start with a technology solution and then try and make it work for people? It’s not going to work. It’s going to be, you know, not personalized. It’s going to not solve the problem. If we start with the people problem and then we say, how do we help use technology to change that, then we can really start to change people’s hearts and lives. And so the kind of vision I have for where apps are going to go in the future is that not going to change people’s lives. That’s not how it works. But they’re going to play an augmenting role in helping do that. 24:57 How did you come up with a strategic plan? How do you, do some of these things that can really assist other churches that are wanting to grow and become like the north points in the Christ church and the values and the cross fellowships or the world, you know. But we don’t often get to hear from those people who are not the senior pastors by the people who are the executive pastors actually making the day to day decisions on setting culture and values and how to engage with staff. And so we want to ask them really hard questions. This is not a inspirational conference. We don’t want you to go away feeling inspired. There’s a hundred other conference and we want you to go away feeling equipped that you heard some content that you haven’t heard before.